Our school, based upon Christian Values provides a happy, safe environment which enables each individual to achieve their full potential and become a well balanced and responsible person. Provide each individual child with an attractive, stimulating, caring, learning environment, where all members of it’s community are valued. Promote high standards of behaviour. 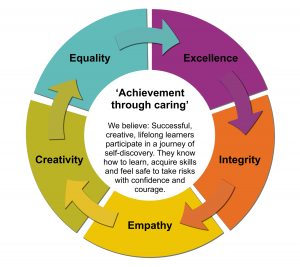 Place the education of the whole child at the centre of our school ethos. Recognise each child as an individual. Activities are planned to address their specific needs. Enable all children to achieve their full potential through the broad, balanced and challenging curriculum. Our aims can only be achieved by increasing the confidence, trust, tolerance and care between all members of the school community. Through your support and co-operation, positive attitudes towards school and learning will be attained and developed by all pupils during their time at Tilstock C.E. Primary School and Nursery. The school provides a range of experiences to enhance the children’s learning, including inviting visitors into school and school trips.